"A Very Zombie Christmas" is an irreverent salute to the holidays. 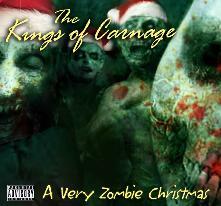 The “Kings of Carnage” bringing some holiday cheer - zombie style, with hilarious and vulgar holiday songs including The Night before X-mas, Jingle Bells, 12 Days, Dreidel, Silent Night, and more. Keith Arem, Valerie Arem, Steve Blum, Nolan North, Fred Tatasciore. Mature Audiences only. Parental Discretion advised. A Very Zombie Christmas is a parody and uses the names of public figures for purposes of satire. Any other names are invented. Any actual names or likenesses of celebrities, characters or games are used in a fictitious and parodic manner. All characters and events on this recording are entirely fictional. © 2010 PCB Productions, Inc.